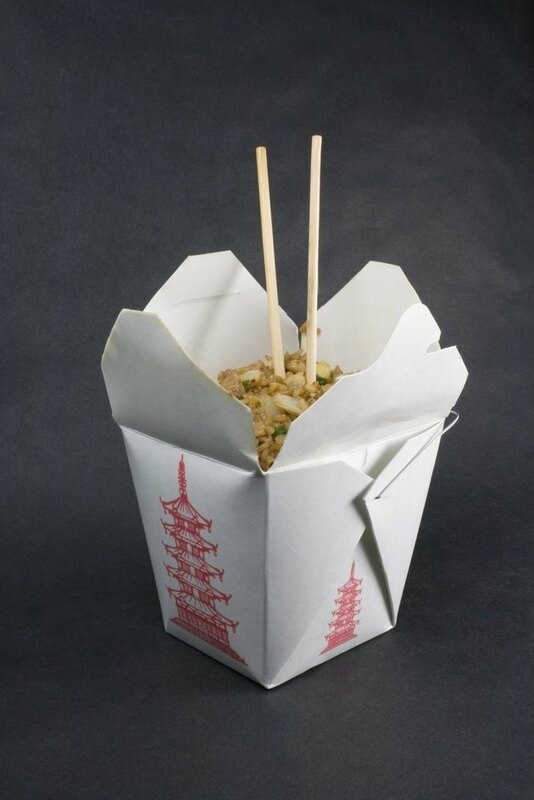 Fried rice dishes are standard fare on Chinese food restaurant menus. The side dish comes in a variety of forms ranging from vegetarian preparations to more substantial protein-based options made with shrimp, chicken or beef. The wide scope of forms of the traditional dish translates to an equally wide scope of nutritional values, but consistency among standard ingredients and methods of preparation create a general nutritional range for assessing fat content. According to the U.S. Department of Agriculture Food and Nutrition Information Center, a standard 1-cup serving of fried rice from a Chinese food restaurant contains 3.2 g of fat. Though the USDA nutrient values are considered a reputable authority of nutritional information, several other sources cite standard fat content as significantly higher than the USDA estimation. For example, the Center for Science in the Public Interest estimates that a standard 4-cup restaurant fried rice entree contains 10 g of saturated fat alone. National Chinese restaurant chain Panda Express lists the total fat content of their fried rice side dish at 18 g. "Cooking Light" offers a recipe for a lighter version of fried rice and lists the original fat content as 43.8 g.
Most fried rice dishes are prepared with similar ingredients in basically the same way. White rice is first steamed or boiled before it is then fried in hot vegetable oil. Additional ingredients, such as vegetables, soy sauce, eggs, meat and spices are stir fried with the rice to make the final dish. The amount of oil used for frying is a significant factor in determining final fat content. Including higher-fat meats also increases fat content, especially if the meats have been deep-fried prior to stir frying. Fried rice dishes also may be made with additional sauces that are typically made with oil. Because of the range in preparations, ingredients and serving sizes, reported fat content may vary from 3 g to 40 g.
The Food and Drug Administration advises a daily intake of no more than 64 g of fat, or less than 20 to 35 percent of the source of your total caloric intake. Depending on the precise ingredients and other ingredients in the fried rice dish, it may qualify by your dietary standards and needs as a high-fat dish. Even if your fried rice dish reflects a lower fat content, consider additional nutritional information when choosing fried rice. The Center for Science in the Public Interest estimates that an average entree portion contains 2,700 mg of sodium as a result of added salt in sauces. Meats added to the dish increase the protein value but also the fat content. The caloric value ranges from 228 calories to more than 1,500 calories depending on serving size and the method of preparation. Simple adjustments in preparations lower the fat content to reflect your dietary needs. "Cooking Light" recommends reducing the amount of oil needed to stir fry the rice to 2 tbsp. for every 2 1/2 cups of rice. Opting for lean meats and egg substitutes reduces the fat content without sacrificing protein. Limiting additional sauces, such as oyster, fish and sweet-and-sour, eliminates additional fat, calories and sodium as well. When ordering in a restaurant, ask the chef to use less oil, no butter and to hold any additional sauces or serve them on the side so you can control the content.